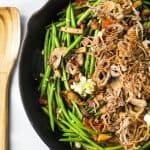 The Ultimate Healthy Green Bean Casserole with bacon and homemade fried onions. This thanksgiving classic is every bit as good as the original green bean casserole! Heat a large cast iron skillet to medium high heat. Add diced bacon to the pan and sauté until crispy, about 4-5 minutes. Using a slotted spoon remove bacon from pan and place on a paper towel lined plate. To the pan of bacon grease add roughly chopped mushrooms. Saute until slightly browned stirring throughout, about 5-7 minutes. Remove mushrooms from the pan. Next add in garlic and fresh green beans to skillet. Saute until slightly browned, 7-9 minutes, stirring throughout. Once green beans are browned add bacon and mushrooms back to the pan, season with salt and pepper. Toss to mix everything. Reduce heat to low and cook another 5 minutes then remove from heat. In the meantime, add sliced shallots to a small ziplock bag with arrowroot. (or cornstarch) Set aside. To a small saucepan, add coconut oil. Heat oil to about 350 degrees F in temperature. You want it hot enough to “fry.” One way to test this is to gently dip one of the shallots in to see if it sizzles. If it does then you’re good to go. Once oil is hot, add coated shallots to the oil in batches. Fry the shallots for 3-4 minutes, or until browned. Remove from oil using a slotted spoon and place on a paper towel lined plate. To serve add fried shallots to the green beans and serve!